Irrigators’ tribunals of the Spanish Mediterranean coast:The Water Tribunal of the plain of Valencia was inscribed in 2009 on the Representative List of the Intangible Cultural Heritage of Humanity. The irrigators’ tribunals of the Spanish Mediterranean coast are traditional law courts for water management that date back to the al-Andalus period (ninth to thirteenth centuries)and are recognized under Spanish law. This institution regulates the use of water to irrigate the fertile plains of the Region of Valencia. The Water Tribunal comprises eight elected administrators representing a total of 11,691 members from nine communities. In addition to their legal role the irrigators’ tribunals play a key part in the communities of which they are a visible symbol, as apparent from the rites performed when judgments are handed down and the fact that the tribunals often feature in local iconography. Inspiring authority and respect, the court, whose members are elected democratically, settle disputes orally in a swift, transparent and impartial manner. They provide cohesion among traditional communities and synergy between occupations (wardens, inspectors, pruners, etc. ), contribute to the oral transmission of knowledge derived from centuries-old cultural exchanges, and have their own specialist vocabulary peppered with Arabic borrowings, promoting traditional governance and amicable conflict resolution, while enhancing the visibility of intangible cultural heritage, promoting dialogue among cultures and testifying to human creativity. In short, the courts are long-standing repositories of local and regional identity and are of special significance to local inhabitants. 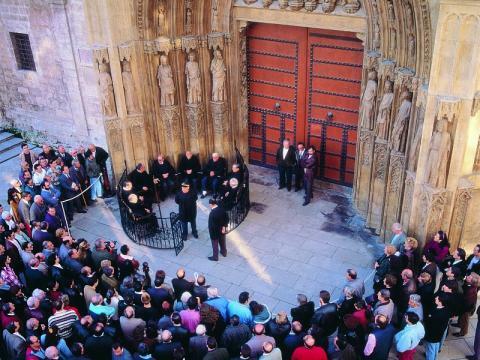 Every Thursday, the gothic “Puerta de los Apóstoles” (The Apostles’ Gate) becomes the setting for the Water Tribunal, Declared Intangible Cultural Heritage of Humanity by UNESCO. The Baroque “Puerta de los Hierros” (Iron Gate) is the main entrance next to the bell tower known as “El Miguelete”, the embleme of Valencia.